Directions (1-5): Study the following table carefully to answer these questions. Q1. Find the difference between total workers employed by all units in 2001 and total workers employed by all units in 2003. Q2. Find ratio of workers employed in C and D together in 2001 to workers employed in A and F together in 1998. Q3. Total workers employed in unit C throughout all years is approximately what percent more or less than total number of workers employed in unit E throughout all years. Q4. In 2000 average number of workers employed by all the unit together. Q5. Total number of workers employed by unit B throughout all years is approximately what percent of total number of workers employed in all units in year 2003. Directions (6-10): What will come in place of question mark (?) in the following questions? Q10. 76% of 1285 = 35% of 1256 + ? Q11. A tank is fitted with 8 pipes, some of which that fill the tank and others that empty the tank. Each of the pipes that fills the tank fills it in 8 hours, while each of those that empty the tank empties it in 6 hours. If all the pipes are kept open when the tank is full, it will take 6 hours to drain the tank. How many of these are filling pipes? Q12. The average monthly salary of 12 workers and 3 managers in a factory was 600. When one of the managers whose salary was 720, was replaced with a new manager, the average salary of the team went down to 580. What is the salary of the new manager? Q13. A sum of money invested for a certain number of years at 8% p.a. 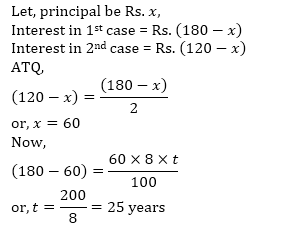 simple interest amounts to Rs.180. The same sum of money invested for the same number of years at 4% p.a. simple interest amounts to Rs.120 only. For how many years was the sum invested? Q14. A, B and C enter into a partnership by investing Rs.3600, Rs.4400 and Rs.2800. A is a working partner and gets one-fourth of the profit for his services and the remaining profit is divided among the three in the ratio of their investments. 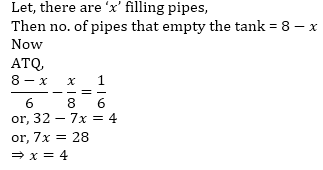 What is the amount of profit that B gets if A gets a total of Rs. 1800? Q15. The barrel of a fountain pen is cylindrical in shape whose radius of base is 0.7 cm and is 5 cm long. One such barrel in the pen can be used to write 300 words. A barrel full of ink which has a capacity of 15.4 cubic cm can be used to write how many words?